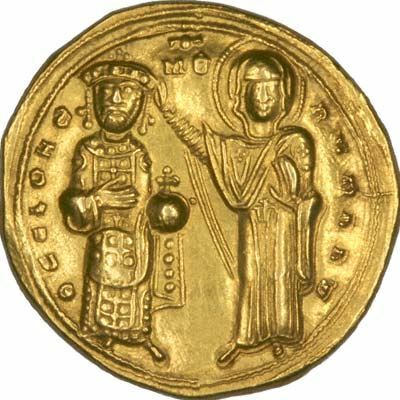 Romanos III was Byzantine emperor from 15 November 1028 until his death in 1034. He was a Byzantine noble and senior official in Constantinople when, at the age of 60, he was forced to divorce his wife by Constantine VIII and marry the emperor's sister. Three days later the emperor died and Romanos inherited the throne. The new emperor showed great eagerness to make his mark as a ruler, but was mostly unfortunate in his enterprises. He spent large sums on new buildings and in endowing the monks. His endeavour to relieve the pressure of taxation disorganised the finances of the state. His failure to stand up to the powerful aristocracy undermined the landed peasantry on which the army relied. "The strength of the armed forces and of the revenue declined, and the consequent impoverishment weakened the military power of the state still further." At home Romanos III faced several conspiracies, mostly centred on his sister-in-law Theodora, as in 1029 and 1030. Although he survived these attempts on the throne, his death on 11 April 1034 was supposed to have been due to poison administered by his wife, though there is also speculation that he was drowned in a bath on his wife's orders. He was buried in the Church of St. Mary Peribleptos, which he built.